Within her first week of joining ClientKit™ Lexi not only got her first sale, but she got very clear on her avatar and offer. Lexi also realized how important positioning is because people are watching even when we don't realize it. 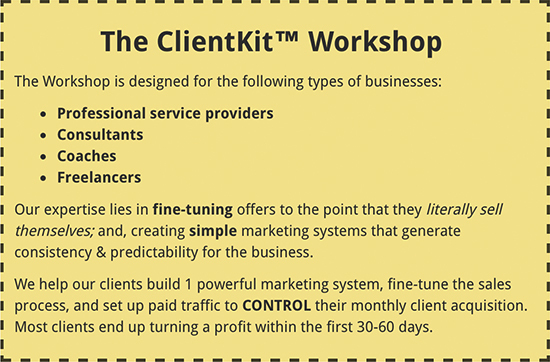 Within a week of joining ClientKit™ she signed up three clients. Yes, she had three strategy sessions and landed three clients. Prior to CK she had made $4000 in revenue after being in business for nine months. In a week with CK she eclipsed that. Erica just got a client who paid in full. She had a few sales when first started CK, but hit a slump. Her biggest challenge was building confidence in how to be a leader. She was willing to trust the process and stick to it. She worked on her mindset daily and used all of the resources that the CK experience provides. Katya got invited to speak at a Mastermind event. She was nervous, but she used what we teach in ClientKit™ to show up as a leader and booked 13 Strategy Sessions in a matter of minutes. Kevin came into ClientKit™ to build his business so he could let go of his full-time job. He quickly realized that he had some mindset issues that were getting in the way of his success. He made some adjustments to his mindset and in his messaging and closed his first client. Steven got some quick momentum by taking immediate action when he first joined ClientKit™. His first organic post got him his first client. He continues to work the process, just a few weeks in, and has picked up another client from that initial post. Candice is a Spiritual Intuitive. She joined ClientKit™ and within a couple of weeks she had signed her first two clients. Candice got these results when she STOPPED overthinking everything and just started taking action. JR had a rough start to his ClientKit™ journey. He had 16 strategy sessions and NO sales.He discovered that he was talking to the WRONG people. Once he found the right clients he signed four-in-a-row. JR says, "Trust the process and reap the rewards." Julie came in doing just a few grand per month, and within 6 months she was able to replace a multi-six figure salary, quitting her job and actually moved her family to HAWAII ;) literally what you call "living the dream." Michael is already successful in his consulting business but is ready to automate and scale to have more time for his grandkids and grow to $50K a month. While he just started his journey, he's hooked and is fired up about the progress he's making. Renée got slowed down by some life challenges. BUT, she stayed plugged into this environment and the consistent effort she had put into building her business using the ClientKit™ system helped her overcome the challenges. Erica had been struggling to make enough money from her business to pay her bills. Within a few short weeks, she's earned more money than she's ever made. She's now doing what was once impossible for her. Jim has been rocking in business since he's joined our family. He decided to create some friendly competition with another client and was able to pull in $7,785 plus a retainer in one day. Ryan has rapidly taken his business from a few hundred dollars per client to over $20K in retainers. He's now working on expanding even further. His $7,500 day makes his goals much easier to hit. How do you know when you're doing the right things in your business? When your competitors sign up for your services. How do you make that happen? Do exactly what Taylor and Chris say and become obsessed with the process. Bradley was about halfway through the program when he recorded this video for us. He's been doing this kind of coaching for a while, but our digital acquisition strategy is a new addition to his business. Victor and Kayla were tired of getting under-qualified clients. After following the process, honing in on their perfect avatar and dialing in their offer, they quickly signed on their first high end client. Alexander wanted to "bolt on" a new consulting offer to his business. We helped him narrow down what expertise to build on, who to target, and launched his traffic with him. Erica was working with clients who weren't ideal and weren't doing the work. After going through our process, she brought in her first perfect client within 2 weeks and is now loving the work she does. Jared was trying to get copywriting clients. We told him we were concerned with his current income and actually didn't let him in right away. He took out a new credit card because he knew we could help, paid for itself inside of 30 days. These guys are awesome. They were doing a health product, and wanted to level up. We built a brand new high-ticket offer with them, and put together their feeder funnel. They did $20K in 20 days and haven't slowed down since. Bob is an automation expert who had previously done 30-50K per month. His business had been declining for several months. We helped with his sales script & paid traffic, he did 100K in 60 days. Peter spent years selling for another high-ticket consulting program, but when he wanted to build his own offer, he hired us. A couple months in, he's living it up in Costa Rica, changing people's lives, and on his way to being a millionaire. Just watch the video. This guy had NEVER one sales calls before. Super rad guy. John had leads coming in from another "coach" but they weren't helping him with his sales / closes. That's a common problem, this confusing 'maze' of programs that are all incomplete. He pulled the trigger and has done about $14k in the last 10 days ;) just getting started! Ander actually took out a loan to work with us. He'd tried paid traffic, spent several thousand and made nothing. We helped him build his feeder funnel correctly and he ROI'd within the month. Dan is a mindset coach and had a bunch of training from various sources. He never could tie it all together. The first thing we did is fix his "offer" and then started his paid traffic. He'd done 10K in the first week. Shawn is an SEO strategist who's been charging monthly low-ticket prices ($750-$1500/mo). Within 10 days, we've re-built his acquisition offer, he's monetized his investment back, and he's on his way to tripling his current business. Kim had to turn ALL of her ads off because she got too busy (lol). In this video she talks about us being "pushy" which really means we just push you to make money and earn an ROI ;) within about 5 weeks she had momentum going and now her biggest problem is she doesn't have enough time to facilitate it all! Jim was selling done-for-you services through his agency which was working ok for him. However, through realigning his offer to what the perfect client needed, he's now a marketing consultant that gets them massive results, not a service provider. This positioning has allowed him to hit almost $30,000 in July. Daniel is a music producer himself and helps other producers explode their business by getting new clients through the internet. Before CK, he was basically giving his services away. We helped him refine his offer and TRIPLE his prices. He was a little unsure about there being enough clients out there for him. He's turned on his webinar and is getting 10 strategy calls a week and closing consistently. "When I invested in myself it flipped a switch. I became a different person." Tanner is a personal trainer who helps high performers reach their goals through fitness and nutrition coaching. He spent $50k on coaches prior to joining ClientKit and DID NOT see a return. In the first few weeks of CK he was on pace to have a seven-figure business. If he hadn't joined CK he would have eventually figured it out. BUT, he wanted the faster path to get max results while putting in less time. "You can either stay stuck where you are, or you can invest and get what you want now." Chantal coaches entrepreneurs in the pet industry. Before ClientKit™ she had tried several things to launch her coaching business. None worked. She felt like she had tried everything and never found a SIMPLE system that she could implement quickly. She's done $120k in the four months since joining CK and is now part of our Upper Echelon Mastermind. If she hadn't joined CK Chantal thinks she would still be charging a few hundred dollars for her program, she'd be poor and completely overwhelmed with client work. Instead, the opposite is true. Ready to get started? Jonathan is a podcast expert who helps other experts take their businesses to the next level. He has doubled his revenue since joining ClientKit™. But, it took JR 3 months to make his first sale. It was a whole mindset and business retooling situation. The thing is, JR persisted and now finds himself working LESS and making MORE. So cliche, right?! But true. If he hadn't joined CK, JR thinks he would be in the same place in his business and also wouldn't have grown into the leader he is today. "Instead of investing in a course, invest in your environment to get the ROI you want." Jack is a copywriter who specializes in webinars for high level coaches and course creators.Prior to ClientKit™ he had a lack of CLARITY. And didn't know how to get his market's attention and hold it. When he started CK he wanted to hit $5k/mth. NOW, he is hitting $30k/mth and set to blow past $50k. His business grew so fast that his family asked if it was legal! Jack says, "What do you want for yourself? Bet on you and take the leap!" Peter helps businesses build successful sales teams and keeps those sales teams performing at the highest levels. One of the biggest things Peter got from CK was clarity. It allowed him to start hitting $20k months and beyond. He felt like once he got into the CK environment he had 'found his people.' Peter knew that environment was pivotal to his success. Now he has a business that produces more revenue, requires less of his time AND allows him to fully unplug when he wants. Dan B. is the Head Nerd at Adwords Nerds which is an online marketing company that helps real estate investors find motivated seller leads online. Dan came into ClientKit™ because he wanted to automate his lead generation and not rely on referrals. When he started CK he was doing about $5k/month and got to $20k per month in 8 weeks. He made the decision to push beyond the comfort of $20k to $30k a month and joined the Upper Echelon and in a few months got to $150k/mth. Dan saw the value of leveraging Chris and Taylor's experience to explode the growth of his business. One of the most valuable parts of his experience with TF is the environment. He's also been able to pull himself out of the day-to-day operations of his business so he can focus on what the next chapter is for his company. Katya is helping Entrepreneurs scale to or beyond 7 figures with systems and operations. She had been following Traffic and Funnels for a while before she took the jump into ClientKit™. She found the strategies taught, the mentorship and community to be the most impactful parts of CK. Katya was able to double her revenue from $8k/mth to $17.5k/mth within three months of joining. Katya says, "If you know this is the best next step for you but you're terrified because of whatever reason, take the leap." Tasha is a fertility coach and patient advocate. She launched her company at the beginning of 2017, but had been working with women on this for seven years. She spent nine months growing a list and put together a launch for a $99 product and she got NO sales. This huge fail pushed her to leap into ClientKit™. Within 8 weeks of joining she made over $20k in revenue. Tasha is now confident that her program will help her completely change the fertility industry. Billy is a Facebook Ad Expert for course creators and experts. ClientKit™ helped him take his thinking about his business to new levels. It allowed him to simplify his business model AND increase his revenue. One of the biggest takeaways was how to approach sales in a way that REALLY serves people. Mike has a digital marketing agency that offers paid marketing services. Before joining ClientKit™ he was taking on any client he could get. Mike was too busy in fulfillment and ended up cutting half of these 'not ideal' clients loose. CK helped him raise his prices AND find the right clients. Not only that but he is now delegating aspects of the business that are giving him the experience of working ON in his business instead of just IN it. Mike says, "If you can follow a process then I don't see how you could fail (in ClientKit™)." David is a Facebook™ Ads Expert and works exclusively with chiropractors to help them explode their business. When he joined ClientKit™ he needed systems to grow his business, but he REALLY needed an environment of people that would help push him to the next level. When David came to CK he was doing $25k to $30k a month while still working a full-time job. Taylor helped him see the madness of that and David quit his job so he could focus on his business and finding the RIGHT clients for him. David is now at $30k to $40k a month and knows how he will get to his goal of $100k per month using the CK system. David says, "If you're ready to start or grow your business then this is the right place for you." When Erica first started ClientKit™ she had no clear direction on how to consistently bring in revenue. Surprise, surprise she found us through a FB ad which led to our webinar. Erica found a new perspective by being in the high-level environment that is CK. It helped her navigate some big challenges in her business and life AND she took her business to the next level. Sonya is a success strategist for women in business. She helps them recreate their business to increase their revenue and impact. Before ClientKit™ she wasn't getting the traction she wanted in her business. She was struggling to figure out what would work for her business. Taylor and Chris' authenticity helped Sonya see that this was the program for her. She found the atmosphere to be the most beneficial part of the program. Just being around successful people allowed her to make that a new normal. Sonya's biggest 'ah-ha' moment was when she repackaged her offer and saw how it upgraded the experience for her and her clients. Cindy is a tax expert who saves her clients thousands of dollars on their taxes. Cindy's business was doing ok before joining ClientKit™, but she felt that there was room to grow. After watching our webinar she knew that the CK formula was right for her. The program was exactly what she thought it would be AND the CK environment surpassed her expectations. ClientKit™ has taken Cindy and her business to the next level. She's also noticed that it shifted her staff and clients in a positive way. Cindy's life was fine before, but now she gets to live out her dreams. Greg came into the program because he had hit a revenue ceiling doing 'Done For You' services. He knew he needed to improve his sales system and also knew that Client Kit™ was what he needed. After going through the program he feels more in control and more confident. He's been able to let go of some clients that were a burden. On top of that, his clients are getting better results! His team is now flourishing using what he learned in CK. Greg has been able to create multiple lead generation streams and doesn't have to rely on referrals. Ayries works with innovators, change makers and creatives to scale their stories so they have the platform they need to create massive change in the world. She had been through many trainings before and was searching for the right program to build her business and become a leader. From the moment she watched one of Taylor's videos she felt she found the right next step. While Ayries was able to create revenue in her new business, her biggest wins were with mindset. Now she understands what it takes to be a leader and to run a wildly successful business. Justin is a Digital Marketer who helps clients build and refine a digital marketing system. He wanted to grow his business and knew Traffic and Funnels could help him scale to seven figures. Not only has his revenue grown, but he has simplified his services to be able to create a healthy and sustainable environment for his team. If he hadn't joined Traffic and Funnels he would have kept his 'high-paying job', but wouldn't have a sustainable and scalable business. Thomas is an internet marketing consultant who helps internet entrepreneurs create more leverage in their business and freedom in their life by setting up systems where they delegate 90% of their work to a team of A players. If he hadn't joined CK Thomas would have continued to worry about his business and money. He no longer worries about either and lives life the way that he wants. Neal is a marketing automation consultant. Before Client Kit He had launched six-figure funnels and always had retainer clients which was holding him back from his true vision. Neal followed Traffic and Funnels for a long time before hopping on a call because he thought his business was different and that CK could not help him achieve his goals. Client Kit gave him the mindset, strategy and tools to make his vision a reality. Not only has Neal hit his goal of $30k a month in his business, but CK has positively impacted every area of his life. Bryan helps businesses get more leads and sales on demand. When he first came to CK he was burnt out and in a tailspin. He knew he had to follow success and stop guessing. He needed a new environment. He found that the biggest value was the simplicity of the program. Through that he was able to simplify his business and his life and enjoy his life more. His calendar is full from ORGANIC traffic and he now has leverage in his business where he can have the income he wants and gets to spend quality time with his five kids. Michelle is a spirit channel and best-selling author of six books. She helps people transition from unfulfilling careers to something purposeful. When she started CK she had two best-selling books, but did not make much money. Once she raised her prices she attracted MORE clients and her clients had greater success. She came to CK to automate systems and scale her business. They got their business to $45k a month using the CK system. This helped her pay off old medical bills and create more FREEDOM in her personal life. Nick has been a successful consultant, but he couldn't break out of the time for money trap. His delivery was always tied to his time and he couldn't scale beyond his current level. He was also charging far less than the value he delivers. In the first 4 weeks, he earned £15,000 which has laid the groundwork to saying no to a £180,000 contract so he can now focus on creating a business on his terms. Jim was earning $2-3k a month recurring but couldn’t grow beyond that because he was undercharging, didn’t have the right offer, and couldn’t clearly communicate his real value. With the clarity and confidence he now has, he’s gotten to $20K a month recurring revenue and is on track to make $30K a month. Bradley was coaching people that came to him through referrals. He loved what he did but wasn't quite sure how to drive new clients that were ideal for the results he delivers. He would wait for clients to come to him, but they didn't come consistently. Now he doesn't worry where his next clients will come from. He has a predictable method to get clients. Sergio tried many methods of reaching clients but they all fell flat. He was charging $300 for 3 months of service and had a hard time raising his prices and finding the right clients. He is now consistently getting $3000 - $4500 from his clients and has new client appointments booked every week. Because he's focused on getting clients' results, not just doing activity, he has more free time now than he did when he was charging low prices. Cherylanne is a life/entrepreneurship coach for females. Her dream goal was to hit 25K in a month. She did that her very first month working with us. She's since upgraded to our year long mastermind, is pulling in clients from paid traffic, doing about 40K per month and well on her way to a 7 figure business this year. Had a lot of offers but his coaching business was dead. He was used to charging low prices and his clients required too much support for the price he was charging.He now gets automated, steady bookings of high end clients coming to him wanting to work with him. Even though he's been traveling, he's already generated $20,000 in coaching clients in a few short weeks. Chris came to us after he'd built several very successful acupuncture clinics. We helped him build a consulting offer to help people in his market get results and within the first 6 weeks he'd done over $50k in revenue. When you listen to this, you'll hear him talk about our emphasis on SPEED and then stabilizing things out once you get core validation. Joel followed us for a while before finally pulling the trigger. He's THE webinar consultant for product owners looking to automate their sales. Problem was, his client acquisition was super random and he had no idea how to control it. Within 2 months he was back in charge of who he worked with, how much they paid him, and when he worked with them. Great place to be. This is the actual story of Jared that I explained earlier. We wanted to capture this because the truth is, some people "get it" and they make investments and grow. Some people don't and they try to save money and waste their whole lives never figuring it out. Jared was nervous as hell - but listen to how he made the decision. Ashley is a book publisher/marketer who works with businesses to get their message to the world. Within 2 weeks she'd completely recouped her investment to work with us and our team - and we found out later that she actually took out a LOAN to get started. That's commitment! Julie is a Facebook ads coach for network marketers. When she first spoke with us, she had a dream to replace her corporate day job and move to Hawaii. We knew that we could help her do this because we listened to her challenges and understood where she was trying to go. Recently she moved to Hawaii and quit her job, and is currently making about half a million dollars per year and ramping up fast. As soon as I met the Vegan Brothers I knew I'd want to interview them and share their story with you. It was a VERY tough decision for them to join. A "crazy leap of faith" to hear them say it. But it paid off, and they've since joined our year long mastermind to grow their business to 7 figures and beyond. Ryan got started when he was charging $250 per package for social media setups. We helped him build a "big boy" package (LOL) and designed his sales system - within the first month he'd done over $10k and is on his way to $50k per month providing lead generation & FB ad services to clients. Aleric was offering tons of offers and services, at different prices, and it was confusing his prospects. He now has a simple, results-based offer and a marketing system that generates quality lead flow for him. In a few short weeks, he’s already closed 4 high-ticket sales with more on the horizon. Bob did 6 figures in his first 8 weeks. Enough said, right? But if you listen to him talk, it wasn't that we made HUGE sweeping overhauls in his business... just a few small tweaks. Sometimes, that's all you need. What if I don’t have any case studies yet? If you're starting a new offer (or a new business), you don't need case studies OR testimonials. Guess what? When we started Traffic And Funnels, we didn't have any case studies (because we hadn't taken any clients yet!). The most important things you need are 1) a good, well mapped out offer that is tuned specifically for your market and 2) a system to communicate that offer, generate interest, and enroll clients from paid traffic. That's where we come in. How much do I need for paid ads? 70% of our clients "ROI" without paid traffic turned on. Go look at the client messages above and you'll see a LOT of them say something like "Made 30K and I don't even have traffic on yet." That's because paid traffic is usually NOT the problem. It's the offer, the market, and there's not a good process / marketing to enroll prospects. We fix that first, and you'll likely make money just from that and THEN re-invest that into paid traffic. Once you get going, average acquisition cost (to pick up a new client from traffic) is about $1k (remember the goal is 7-10X return from paid traffic spend). How do I know this isn’t a scam...? We appreciate this question. You should thoroughly vet the people you choose to work with... but ultimately this comes down to a couple things. First, does what we're saying "make sense"? Can you see how it would work? That's the first step... if the education we've given you (for free) has made sense, then that's the first thing you want to consider. Second, have you had a conversation with us? You can tell a LOT by getting on the phone with someone. Follow your gut. Third, look at the VIDEOS above... the interviews. The amount of people we've helped - genuinely - get results. What do you think we threatened these peoples' families into giving us this stuff? No. We're very good at what we do and we authentically care about people. No scams here. Absolutely not. Consider 99% of everything everybody else tells you that you need to be BS. You don't need a blog, you don't need to have a book... you need a good offer, and a way to find your market online (paid traffic). We didn't have a website when we started either. In fact, we didn't get our website up and running until after we'd already done about $100K in revenue. If you already have a website, great... but don't spend much time on it at all. What if I hate selling? We hate selling too. In fact, we don't really "sell" anything. We help people find out if they're a good fit for us, and if so, we help them get results. You should NOT be trying to sell people on anything. Our system does a good portion of the selling for you before people even take the next step to get on the phone. From there, we'll give you our exact script, word-for-word, and how to lead people to a decision (if they're a good fit). Again, go check out some of the screenshots above of people raving about our script. It isn't pushy, it's super chill and (best of all) it flat out WORKS. Yeah. I guarantee you that if you don't make a change or get the expertise needed to change, you'll either grow VERY slowly or you'll not move at all. When I (Taylor) first got started in business as a freelance copywriter, the VERY FIRST thing I did was find a coach and pay him more money than I had to help me grow faster. It worked, barely three months into my new business I was depositing over $30K per month into my bank. We see it time & time again - there are NO guarantees in life EXCEPT that if you keep doing what you've been doing, nothing will change, and you'll get no results. The "cost" of figuring all this out by yourself is astronomically higher than the "investment" required to work together. The way you "package" your offer determines how much you can sell it for. Some clients come in, we repackage them, and they'll earn $8K, $11K, even $20K in a matter of days - just from having their offer assembled correctly and packaged up in a way that their prospects want. This funnel is similar to the one you've probably gone through (with our webinar). It's designed to educate your prospects, build rapport, and cypher through people who are serious VS people who are NOT. This is custom to your business, it's not a template, we build it with you. If you can't invest $ to produce revenue, you don't have a real business (you have a hobby that you never really know how long it will keep working). Our clients see averages of 7 - 10x ROI from Facebook ad spend. Want to grow your business to $50K per month? With the proper system (which we're building with you in the workshop), it becomes a matter of investing $5K - 7K per month. Simple. Application funnels. Leveraged "hybrid" offers. Backend "upgrades." Etc. If you'd like to grow to half a million to 7-figures per year, you'll need to master the systems involved so you don't work yourself into the ground. The 4th pillar here is all about leverage and time freedom. 90% of clients have generated $20K - $70K from working together BEFORE we get into this 4th pillar. In the nature of transparency and authenticity, we do make a special offer at the end of the call only if you'd like help actually implementing these tactics and strategies and we feel we can help you. Is it required? Absolutely not. Will you receive value & insight from this call even if you don't want to work together? 100% yes. Some people will take the information they receive on this call, implement it by themselves, and see great breakthrough. Some people will see what's possible, and know that working together is just what they need to get results even faster. It's completely up to you but we hope that you'll at least consider scheduling a call, use the information we provide, and let us know what you think! DISCLAIMER: The sales figures stated on this web page and discussed in the video testimonials are our personal sales figures and the sales figures of previous or existing clients. Please understand these results are not typical. We’re not implying you’ll duplicate them (or do anything for that matter). The average person who buys “how to” information gets little to no results. We’re using these references for example purposes only. Your results will vary and depend on many factors including but not limited to your background, experience, and work ethic. All business entails risk as well as massive and consistent effort and action. If you’re not willing to accept that, please DO NOT ATTEND THIS TRAINING.